In late September 1989, South Carolina was rocked by the colossal force of Hurricane Hugo. A category four hurricane, Hugo devastated the coast and other regions of the state, claiming dozens of lives and causing billions of dollars in damage. Hugo was the Palmetto State's most destructive natural disaster in recent memory, but the story of that storm is only part of the larger history of hurricanes in South Carolina. 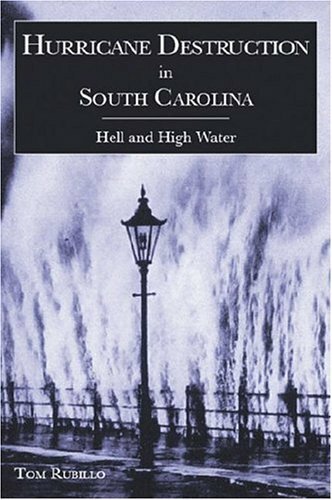 A History of Hurricane Destruction in South Carolina: Hell and High Water examines more than thirty major hurricanes that have struck the state since the 1800s, offering a revealing look at the destruction and loss that results from these violent manifestations of nature's power. Author Tom Rubillo brings to bear a breadth of research and incorporates first-person accounts of the storms and the struggle of survivors forced to rebuild in the wake of tremendous losses. Hell and High Water is at once a history of the damage wrought by the fury of hurricanes and a reminder that the next great storm could be no more than a season away. Tom Rubillo is a Georgetown, South Carolina-based historian and author. He has written a variety of articles for a number of history- and general-interest publications. This is his second book.